He pegs it at about $25,000 Australian dollars a year. Public school immersion starts to look like a pretty amazing deal from the perspective. But we only know of one possible immersion program in Australia. Are there others? The countries of Asia are becoming more and more central to our future – economically, politically, socially, strategically, culturally. As Julia Gillard has said, this is the Asian century, and no country has more at stake in it than Australia. The countries of Asia are becoming more and more central to our future – economically, politically, socially, strategically, culturally. But as Asia becomes increasingly important to us, fewer Australians are learning about it. Nothing governments have tried in recent years seems to make any difference. It is time for some fresh thinking. This is not a new problem. 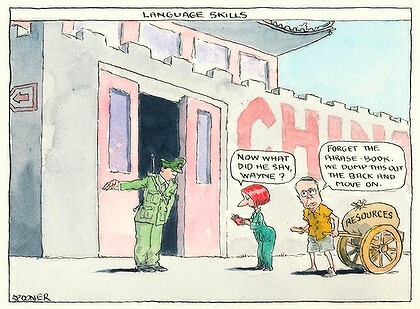 The number of Australians learning Asian languages and about Asian societies has been shrinking for years. The teaching of key languages such as Japanese and Indonesian is in danger of disappearing from secondary schools – the combined result of too few students and too few teachers. And with only a tiny handful of exceptions, the only students who learn Chinese at school are those of Chinese background. The same thing is happening at universities. Asian languages are attracting fewer and fewer students, and those they do attract have not studied an Asian language at school, so their university courses start from scratch. That means the standard most can reach in a three or four-year degree program is pretty basic. In turn, that means the number of well- qualified teachers going into the secondary system is falling, which drives down the numbers who will start to learn Asian languages at school. A classic vicious circle. ← Fundraising, Hiring Underway for New Chinese Language Program In Orange Co.